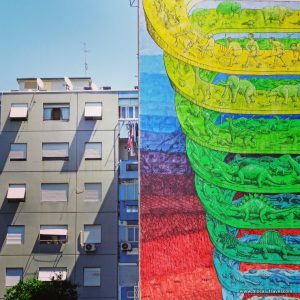 In Rome, as in so many other cities – from Europe to South America – the most political street artist is BLU: a 30-something Italian guy whose identity is hushed – although his art speaks loudly. 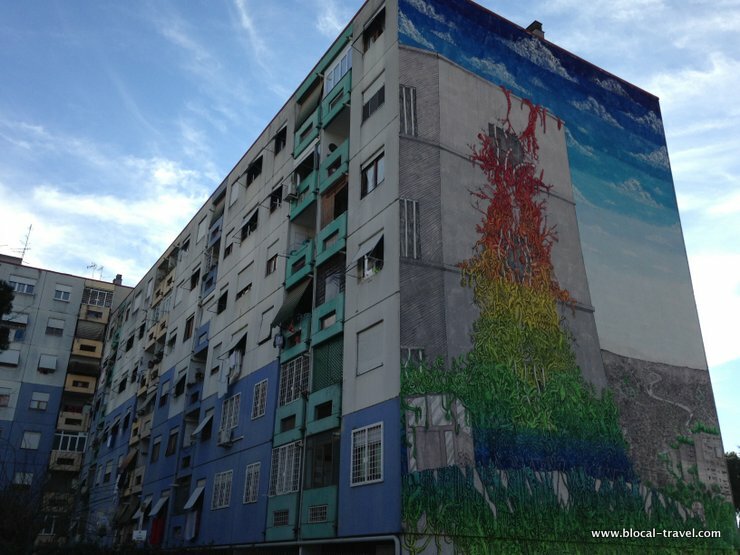 BLU always highlights political and social issues, often painting on squats and forgotten areas of the cities. His works are always over-abundant with metaphors, allegories and symbols, through which he expresses his dissident point of view of our society. 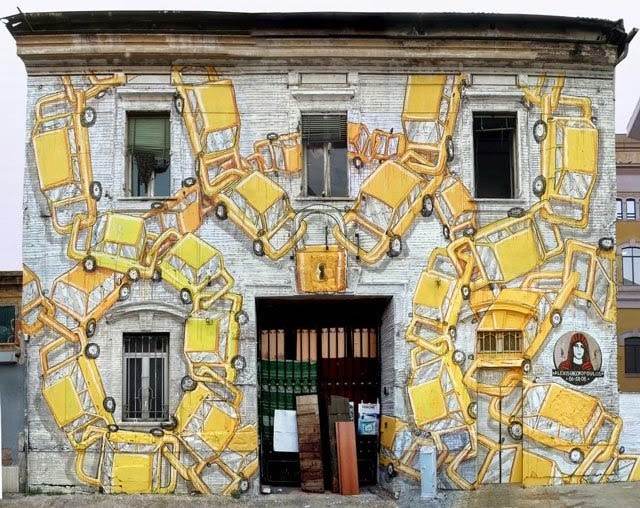 He usually avoids festivals, exhibitions and art galleries, and he even erased his own murals in Berlin and in Bologna to speak against gentrification and the monetization of street art. 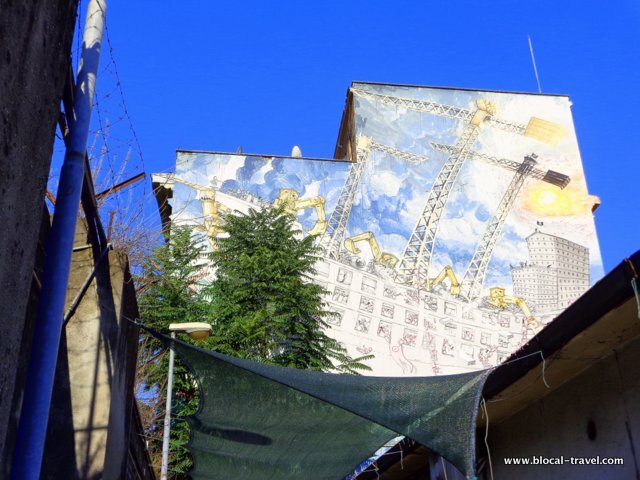 The most popular mural by BLU in Rome is on the facade of a former aeronautical barracks that has been occupied by 85 families from South America and North Africa. This is where BLU played with the architectural elements of the building to transform its huge windows into the eyes of many monsters, each one characterized by its own bright colour and an extremely detailed motif which tells a different story. 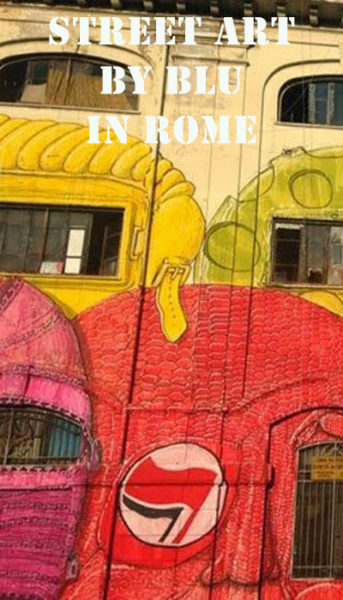 BLU’s monsters speak against pollution, war, Rome’s infamous housing problem, consumerism and more political and social issues, along with references to the surrounding area. 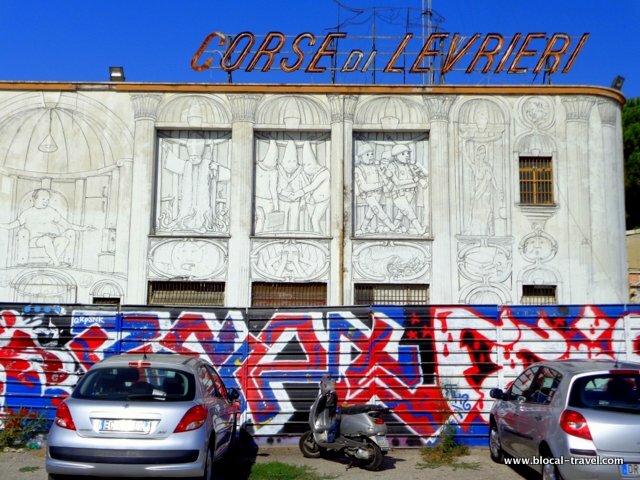 This small building on Via Ostiense was previously owned by Acea (the Italian energy company) and –after that- by Atac (the Roman public transport company). 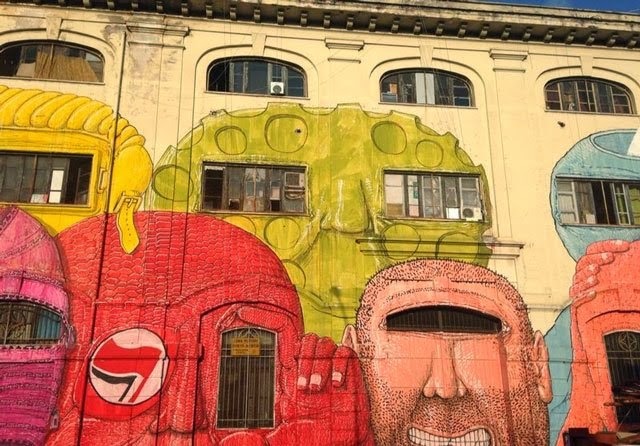 It’s been occupied by students and temp workers who turned it into a popular squat named after Alexis Grigoropoulos, who was a Greek student killed by a policeman in Exarchia during a riot in 2008. 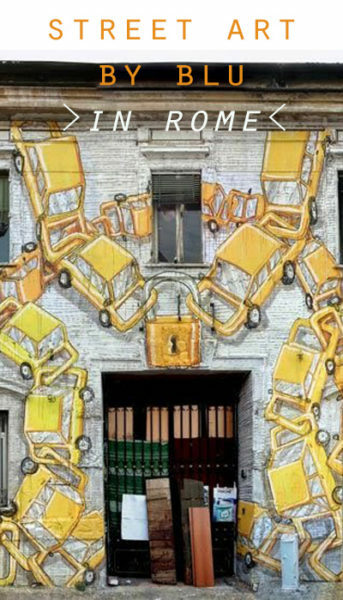 BLU portrays Alexis on the right side of the facade, over an intricate chain of cars held together by a colossal lock –a reference to the chaotic traffic of the area, which makes the city hard to live in. [Edit 2017: sadly, Alexis has been now shut down by the municipality]. My favourite piece by BLU is also one of the first murals he painted in town. It’s from the time when he wasn’t using as many bright colours as he does now, which brings a remarkable contrast between the minimalism of the style (black and white shades in a very simple line) and the grandeur of the project itself. This large-scale piece is on the facade of an abandoned dog track. It’s been occupied since 2002 and turned into one of the most popular squats in Rome: CSOA Acrobax. The whole building has been turned into ancient Roman architecture through a trompe-l’oeil that is itself at the core of the artwork. It’s similar to politicians’ rhetorical speeches, this fake classical architecture looks realistic from afar, but –once you get closer- it shows itself for what it really is: an optical illusion. Reading among the symbolic figures, you can find attacks against religion, consumerism, wars, politicians and more. The mural spreads around the ‘average man’, who is buried in front of TV. 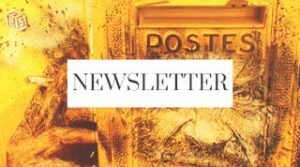 He’s lazy, and made apathetic by mass media treatment – so much so that he doesn’t care about the political scandals taking place all around him. The scandals involve secret societies, puppet-soldiers, politicians (wearing masks and taking money behind their backs), clerics, violent policemen and other people in power. This large-scale mural depicts a metropolis on a sailing ship, which is sinking under the pressure of the urbanization. The ship is assaulted by pirates (illegal, rebellious and painted in bright red), who are fighting to take it back against little grey men (the building contractors on a boat, whose bow is adorned by a robot with the symbol of the Euro). 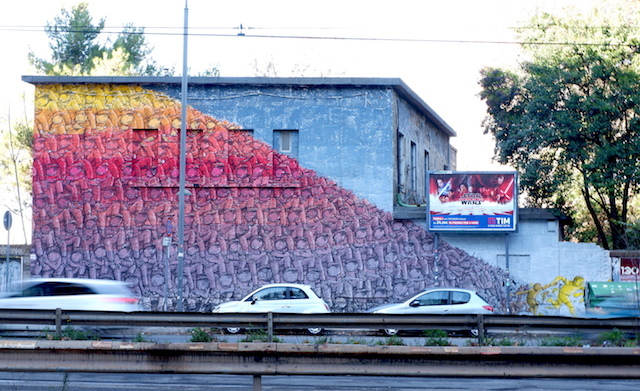 This is probably the most controversial mural by BLU in Rome. In fact, the authorities have censored it. It depicts Saint Basilio (the Saint after whom the neighbourhood is named) boldly walking towards an area of council houses, holding grass shears to open a big lock and, with the other hand, stopping the riot police, which was depicted while turning into a herd of pigs and sheep. This last detail is the one that started the controversy, which ended with the white-washing of the area. 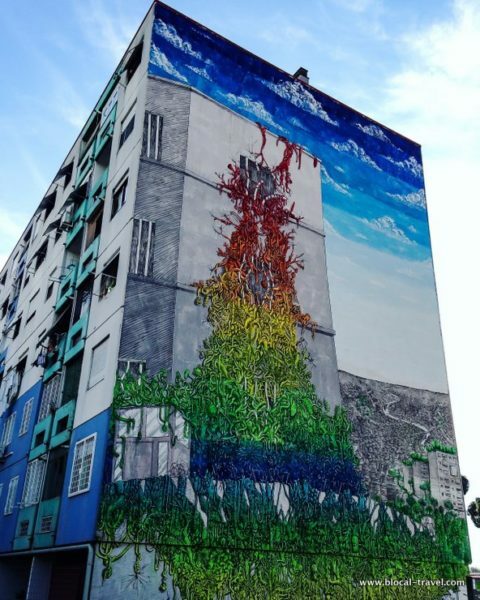 The mural was painted for the anniversary of the death of Fabrizio Ceruso, the 19-year old boy killed by a policeman in 1974 during a protest that took place in San Basilio. That protest is depicted at the foot of the Saint, where dozens of little men are fighting for their houses in the streets and on the roofs. 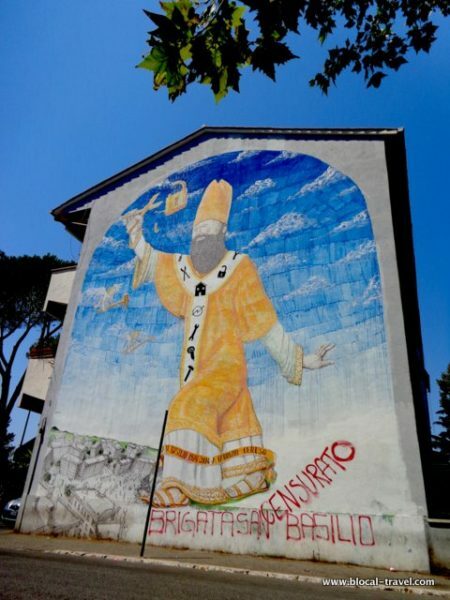 Painted during ‘Mammut Project’, a series of grassroots activities aimed at recovering a public land in the outskirts of Rome, this large-scale mural is about the infamous landmark of the area: the Jail of Rebibbia. 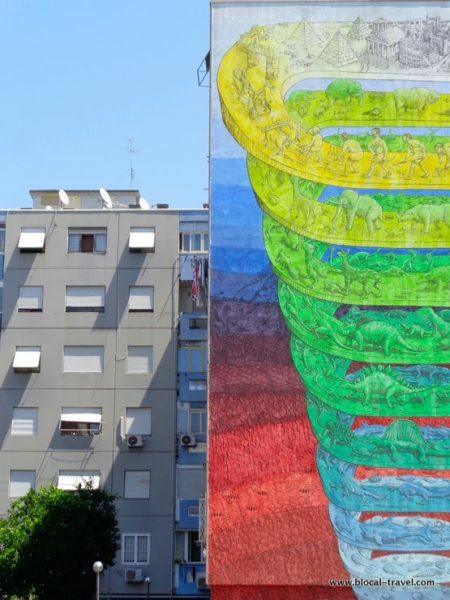 The bright colours of the rainbow (which –in Italy- is the flag of peace, unlike anywhere else where the rainbow flag stands for LGBT rights) are shaped as a three-tentacled growth over the windows of the jail, breaking the iron grating. The colourful skein is made up of many objects that typify our society. It’s why the jail is (at the same time) taken over and generated by the current economic policies devoted to consumerism. 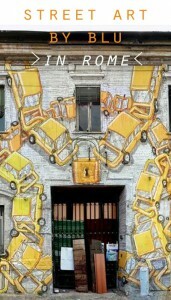 In the same area, there is another bright-coloured large-scale mural by BLU. 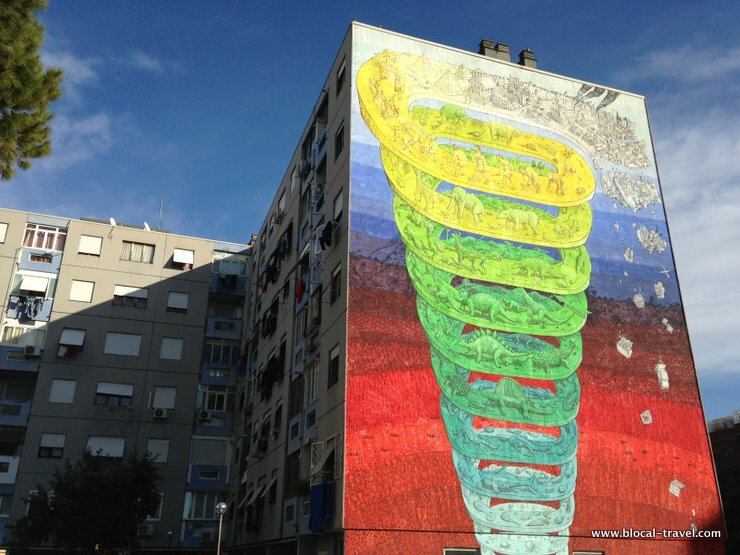 This work is about evolution, which is depicted as a 13-circle spiral whose colours go from the green of the unspoilt nature to the dull grey brought by the human presence on the planet. In the circle inhabited by men, after a series of impressive architectures such as the pyramids and the Coliseum (also known as the Flavian Amphitheatre), the spiral falls apart as soon as military tanks and urbanization make their appearance. 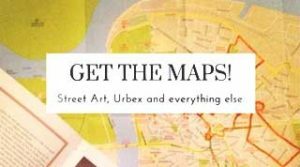 Find these murals (and many more!) 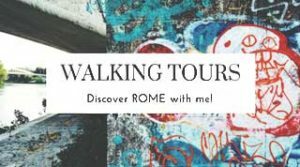 in my Rome Google Map!